When Josh Pastner was hired as the Tigers head coach in April of 2009, the then 31-year-old said he wasn’t going to take shortcuts in rebuilding the University of Memphis basketball program. Pastner said the process was going to take time because he wanted to build it strong for the long-term instead of settling for quick-fixes that produce immediate, but short-term results. And, Tigers fans can rest easy knowing the now 34-year-old Pastner will move forward with his plans for the Memphis hoops program, as he signed a contract extension through the 2015-16 season after the 2010-11 season. In his first season in 2009-10, Pastner stabilized the Tigers program against overwhelming odds. Despite only five returning letterwinners, Pastner directed the 2009-10 squad to a 24-10 record and a National Invitation Tournament (NIT) appearance, advancing to the second round. The next year, Pastner took the youngest team in school history – also the seventh-youngest of 346 NCAA Division I squads in 2010-11 – and guided it to a 25-10 record, the Conference USA Tournament crown and an NCAA Tournament berth. Despite falling to Arizona in the second round, the loss couldn’t take away from the magical run the Tigers had in the 2011 Conference USA Tournament. Memphis put together a “three-game-run-for-the-ages” in the tournament, including a thrilling come-from-behind 67-66 win over UTEP in the title contest on the Miners’ homecourt. Pastner’s third season in 2011-12 was another building block of his vision for keeping Tigers basketball among the nation’s elite. Memphis entered the campaign as the favorite to win the C-USA championship, and despite a couple speed bumps, the Tigers lived up to expectations. Memphis swept the C-USA regular season and tournament titles and earned a second-consecutive NCAA Tournament berth. In addition to producing winning seasons, Pastner and his staff have done an incredible job of developing players. In his only year as a Tiger in 2009-10, former standout Elliot Williams was named Conference USA’s Newcomer of the Year and, following that year, was an NBA Draft first-round pick (22nd overall) by the Portland Trail Blazers. In 2010-11, Will Barton was an All-Conference USA third team selection and averaged 12.3 points and 4.9 rebounds. A year later, Barton upped his averages to 18.1 points and 8.1 boards and took home the C-USA Player of the Year honor along with being named to the CBSSports.com All-America third team. Tarik Black was named to the All-C-USA second team, and Chris Crawford to the league’s third team. Joe Jackson captured the C-USA Tournament MVP award for the second-straight year, becoming the first player in league history to do so. Indeed, Pastner has the Tigers program on solid footing entering the 2012-13 season when, for the first time in his short tenure, he will work with a roster comprised of more upperclassmen than newcomers. But, Tiger Nation should have expected this success as soon as Pastner was hired when looking at his impressive résumé. Before he took over the reins of the Tigers program, Pastner had already coached nine NBA Draft lottery picks. In only season as an assistant at Memphis, Pastner worked with Tyreke Evans. As an assistant at Arizona, Pastner helped develop the games of Jordan Hill, Channing Frye, Jarryd Bayless, Andre Iguodala, Richard Jefferson and Mike Bibby at Arizona. Then, as the head coach of the Houston Hoops summer league team, Pastner mentored Emeka Okafor and T.J. Ford. Pastner’s impressive credentials, though, don’t end there. He won an NCAA title as a player at Arizona (1997), and also made a trip to the NCAA championship game while on the Wildcats’ staff (2001). As an assistant coach since 2003 (six years at Arizona, one year at Memphis), Pastner’s teams advanced to four NCAA Sweet Sixteens and two Elite Eights. In fact, Pastner participated in the NCAA Tournament 13-straight years from 1997-2009. Pastner came to Memphis as an assistant coach in May 2008, and in only his first season as an assistant on the staff in 2008-09, he helped the Tigers continue their rarefied success. Memphis posted a 33-4 overall record and third-straight 16-0 mark in the Conference USA regular season. The Tigers entered the NCAA Tournament Sweet 16 on a school-record 27-game win streak, which was also the longest in the nation in 2008-09. The NCAA Tournament Sweet 16 appearance was the program’s fourth straight, tying a school mark. Memphis made it another sweep of the C-USA crowns, winning the league’s tournament for a fourth-consecutive season. The Tigers also jumped into the top five of both national polls, reaching as high as the No. 2 spot. Memphis finished the regular season ranked No. 3 in the final Associated Press poll and No. 2 in the ESPN/USA Today poll. Pastner came to Memphis after a successful six-year stint as an assistant coach on Hall of Famer Lute Olson’s staff at the University of Arizona. From 2003-08, Arizona averaged nearly 23 wins per season (137-60 record; .695 winning percentage), captured two Pac-10 regular season championships (2003, 2005) and advanced to two NCAA Tournament regional finals (2003, 2005). The Wildcats earned NCAA Tournament berths in each of Pastner’s six seasons as an assistant coach. Pastner, who was with the Arizona program as a player, administrator and coach since 1996, was a key cog in the Wildcats’ recruiting efforts and working with the program’s big men. In his six seasons as an assistant in Tucson, Pastner’s tireless efforts on the recruiting trail paid big dividends, as the Wildcats continued to successfully recruit top-notch student-athletes. Arizona’s recruiting classes were among the best nationally in each of his six seasons as an assistant. In June of 2005, Rivals.com’s Chris Wallace named Pastner one of college basketball’s top 25 recruiters, writing, “Any list of top recruiters must include Pastner.” In May 2008, FoxSports.com rated Pastner as the No. 7 high-major recruiter in the country. And just prior to taking the Memphis head coach position, Basketball Times named Pastner the No. 5 assistant coach in the country in the publication’s April 2009 issue. During his time at Arizona, Pastner was also involved in a wealth of charitable organizations, including the Boys and Girls Clubs of Tucson, Boy Scouts of America, Leukemia and Lymphoma Society, Naval Special Warfare Foundation, Special Olympics and various local law enforcement support groups to name a few. His charitable efforts got him named to the Tucson Business Edge’s “40 Under 40” list for 2007. The honor recognizes local business leaders under 40 years of age. The annual list not only recognizes recipients for professional success, but community involvement, public service and participation in trade groups or professional organizations. Pastner played in 42 games as a Wildcat and finished his career with an average of 0.9 ppg. The Wildcats were 42-0 in the games in which he appeared. Despite his lack of playing time, Pastner’s presence in the Arizona program was invaluable, performing many of the small “behind-the-scenes” things that helped the team win the 1997 NCAA championship and two Pac-10 titles (1998, 2000) during his career. Pastner helped break down game tapes and scout opponents, and he was the shot specialist for many of the Wildcats players. In his 12 overall years with the program, Arizona had a 290-103 record (.738 winning percentage). Pastner earned his bachelor’s degree in Family Studies from Arizona in December 1998, two-and-a-half years after enrolling, the fastest an Arizona student-athlete has ever earned a degree. He finished his master’s in Teaching and Teacher Education in December 1999 before beginning work on his doctorate. 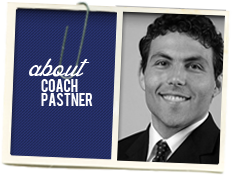 In his role as an undergraduate assistant in 2000-01, Pastner began pursuit of another undergraduate degree. Despite taking as many as 33 units a semester while at Arizona, Pastner maintained a high grade-point average, was nominated for the CoSIDA/GTE Academic All-America team and was named to the Academic All-Pac-10 second team as a senior in 2000. On May, 16, 2009, Pastner married the former Kerri Lamas, and the couple resides in Memphis. Pastner has a stepson, Ethan, and a daughter, Payten Sydney, who was born May 27, 2010.